To provide clean water, sanitation, and proper hygiene education to 25 families in La Supa in the remote region of Trojes, Honduras. 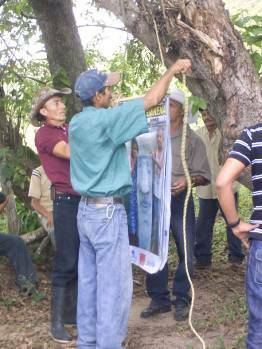 The project has been relevant in relation to the problems and needs of the Arenales Abajo population, especially because it reached the most vulnerable rural groups of Honduras. Its difficult access, small quantity of houses and the disperse house distribution is one of the main reasons why PWW presented this community to PWX and UNICEF to initiate this project. Years would have passed before the government would help this community, if they ever did at all. The government prioritizes bigger and closer communities, from the main town to construct water system projects. Arenales Abajo (La Supa) is not covered by a public water system. 100% of the residents of Arenales Abajo (La Supa) obtain their water from a number of unprotected springs, creeks and streams, apparently polluted with runoff from agricultural activities especially from the coffee harvesting. According to the base line conducted before project initiation, 59% of the residents obtained their water from a spring, 27 percent from a well and 14% from a creek. The base line survey also showed that 86% of the families did not treat their water before drinking and 65% of the Arenales Abajo (La Supa) residents did not have a latrine before the project initiation. The remaining 35% had one latrine but these were in need of great repair. The technology that is being used for sanitation purposes is a pour and flush latrine. At the schools they had 2 latrines one for girls and one for boys but this too needed repairs to be safe for the kids to use. With the project, the coverage of households that have potable water and sanitation is now 100%. 135 people in 25 families are now using biosand filters to treat their water and 25 families have access to a pour and flush latrine. The population already expressed their opinion of the project and according to them, the population incidence of illnesses is lower than before the installation of biosand filters and latrines. Considering that one of the more critical parts of the project is its sustainability we emphasized that all beneficiaries of the project must attend the hygiene and sanitation trainings. They also participated in the construction of the latrines and learned how to maintain the biosand filters. Pure Water for the World worked with community leaders to select four community agents (2 men a 2 women), who are now considered the technicians for the community in case they need reinforcement in filter use and maintenance. These community agents also help the project staff members follow up on the project by visiting each house at least once a week after filters are installed and at least once a month for the first 3 months. They use a monitoring format provided by the project staff so they can report to PWW and the local health center. This will help keep track of filter and latrine usage and also monitor the health benefits. The feedback they provide will be the most valuable asset of the project. In addition, there is a house visit where all families received training in the filter use and maintenance. This is part of the reinforcement of the previous hygiene and sanitation trainings for adults and kids at school. The subjects are: water treatment and storage, sanitation and hygiene. The attendance to these trainings was outstanding. All residents were present and at the school, 35 kids were eager to reinforce their knowledge on the subject. The kids commented that they really enjoyed not having to go in the open field to do their necessities. Now with a latrine at home and at school they had their privacy, especially the girls. After finishing trainings and biosand filter installations, the program continued with a deworming campaign. 135 people were treated with parasite medicine specially kids, staff coordinated with a “nearby” Health Center of Arenales Arriba to mobilized the nurses, so they could keep track of the date when people were treated and coordinate with beneficiaries to get another treatment after 6 months. To assure effectiveness of proper filtered water collection and storage, 5 gallon plastic bottles were distributed in each household to collect filtered water and also a separate container with lid and spout for water storage, so family members do not contaminate their treated water. At the project socialization meeting the president of the community board, Mr. Santos Francisco Mejía, said he and the rest of the people in Arenales Abajo (La Supa) were very grateful with all the organizations involved in this project. They had never received and opportunity this big to improve their quality of life. In that same meeting the town’s official, Mr.Carlos Rodríguez, told the community that they had to work together to repair the road so it would facilitate truck access for the project. Mr. Herminio Ordonez said “This project was a sent by God, who touch the hearts of the donors to help this humble community..."
Xenia Carcamo Sevilla said: "...Now we feel the water we are drinking is safe and sweeter and our kids are not getting sick. The filters for the community had to be transported in a pickup truck, with only a capacity of 5 filters in each load. This meant that to be able to transport the 23 filters, we had to make 5 trips back and forth from Arenales to Arenales Abajo. Once in Arenales Abajo (La Supa), each beneficiary carried their 150 pound filter to their house with the help of staff and the community agent. Due to rain and to avoid flooding of the pits the beneficiaries where told to wait to excavate the pits for latrine septic tank. The last week of March, filter intsallation began. Also, filter and latrine maintenance training, as well as hygiene and sanitation education was given for school kids and the whole community. The whole community was present for this training. This same week, the weather conditions improved and 5 families dug the pit for the latrine so PWW staff also started building the sanitation infrastructure. The construction is complete for 5 latrines. Each family was involved in the whole process and thus, ensuring 100% inclusion at all times. The second week of project, the community leaders had selected 2 people to be the project community agents. Their volunteer job consists of keeping record of the filters and latrines functions, filling a monitoring format provided by the project staff, and to report to PWW staff. The feedback they provide will be the most valuable asset of the project. After the selection of the community agents, PWW staff held training for them with the objective to build local capacity to support total behavior change in use of filter, latrine, hygiene and sanitation. To achieve this we have designed a guide for Community Agents and a monitoring form that facilitates their work. After this training the community agents will be capable of supporting installations, orientation for the villagers on how to dig the pit and village-level hygiene and sanitation improvement activities. Also during this second week a project socialization was held. This meeting is meant to present the project to the whole community. With the previous implementation of the demonstration house, the attendees had a better idea of what to expect from the project and the community leaders already had a list of people interested in the project . Considering that one of the more critical parts of the project is its sustainability, we emphasized that all beneficiaries of the project must attend the hygiene and sanitation trainings as part of their requirement for receiveing a biosand filter and latrine. Community members were strongly motivated towards improving their water quality and having a latrine and they agreed to attend. Pure Water for the World initiated the project on the first week of March 2010, conducting a base line survey of Arenales Abajo ( also known as La Supa). It was carried out by one staff member with the full participation of one community representative. Field work was conducted in two parts:Health Data Collection from the Health Center in Trojes, and interviews in the community regarding their water treatment methods. It was a tough job; it took approximately 3 days for Karla, our health promoter, to finish the surveys. 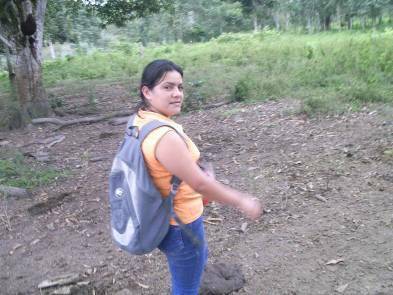 She had to walk long distances from one steep hill to another as she conducted the community survey. On the 4th day of this same week, staff organized a brief introduction meeting of the Project with Community leaders or members of the social groups in the area (*patronatos: community boards). After which the attendees would be invited to suggest a suitable *demonstration house which might be used to show the function, capability, use, and maintenance of the filter. It would also serve as an example of how to maintain a hygienically safe environment in the household. 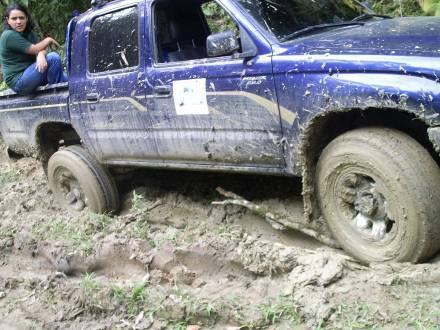 During the initial assessment of the community, the PWW vehicle became stuck twice. Attached are videos showing them being pulled out of the mud. Even though water treatment and sanitation facilities may be constructed in a community, if people do not become empowered in the use of these facilities properly, implement good hygiene methods like washing their hands after defecation, store water safely to name a few, diseases caused by poor water and sanitation may still exist. After project completion, PWW will conduct a interchange of experiences in filter and latrine project among all community agents in the 36 communities. They will give us feedback in how the project is running. We handed gave the list of beneficiaries to the local health center so they could keep record of filter and latrine coverage, in order to analyze if at the end of the year diarrhea cases from Arenales Abajo are less frequent or non existent. With the $8 contribution received from each family that has a filter and a latrine follow-up will be possible for a period of 3 months. As part of the empowerment of the project each family was involved in the whole process of the project thus ensuring 100% inclusion at all times. Education and promotion were crucial in all the phases of the project. The participation in trainings was exceptional especially trainings with kids at the schools. Also by having the local community agents to support total behavior change in use of filter, latrine, hygiene and sanitation and reporting to the local health authorities periodically of the status of filter usage, they can keep track of the health improvements. Also as part of the technical support we provide each community agent with 5 sacks of media for installation, in case they need to re-install a filter. In Arenales Abajo they do not have a health center, the nearest is approximately 1 1/2 hours away, but most of the people walk for almost 3 hours when they need health assistance since the transportation by vehicle is very limited. One of the main drawbacks of this project has being the difficult access to La Supa. Even though it is not far away from downtown Trojes, the road to this community is in very bad condition; sometimes the only way to get there is by horse, especially during winter (rainy season). During our initial visit to the community the 4x4 truck got stuck in the mud twice. The first time local men helped us tow the truck out and the second we did it with the help of 2 bulls. Each time the truck got stuck it took 1 hour of project time to get out of this frustrating situation. In view of this situation PWW staff had to leave material for latrine construction and filters stored in a community center, in a nearby town called Arenales to be transported in small quantities to Arenales Abajo in a Pickup. This way the rate of installation was 2 to 5 latrines a day- normally in one day we could install 14 to 20 filters a day and at least 5 latrines. Another unexpected issue was the lack of health records for this community in the nearby community center. We had no updated data from the health center in the amount of diarrea cases of Arenales Abajo and people when interviewed where not that precise or sincere in how many times they had presented a case of severe diarrhea. So the impact of this area of the project has to be based in testimonies. Arenales Population consists of 135 people: 64 Female, 75 Males. Among those 51% are less than 17 years old and of those 15% are 5 years and under. Half of the Supa population is between the age range of 6-17 years. 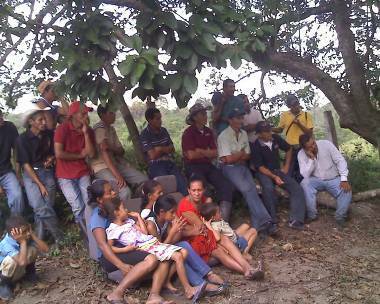 65% of the Arenales Abajo (La Supa) residents did not have a latrine before the project initiation. The remaining 35% had one latrine but these were in need of great repair. The technology that is being used for sanitation purposes is a pour and flush latrine. At the schools they had 2 latrines one for girls and one for boys but this too needed repairs to be safe for the kids to use. All the town residents, especially women and kids, were treated with parasite medicine.